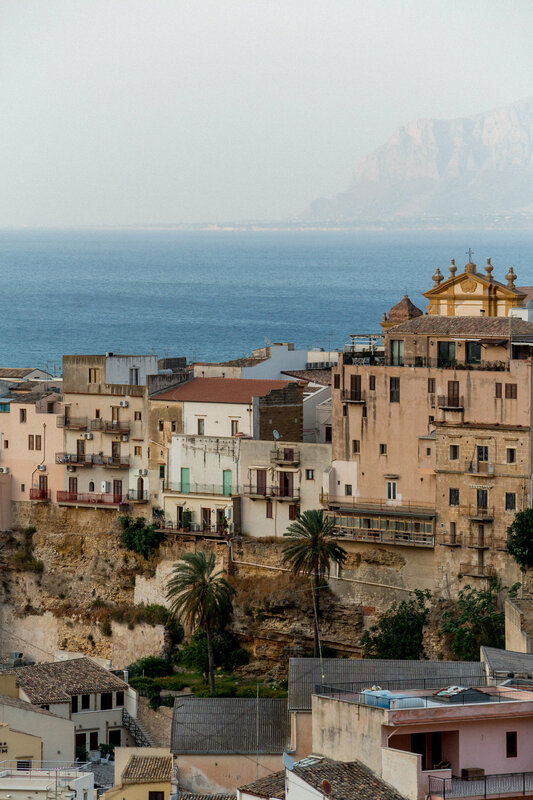 Erice and Castellammare del Golfo were the two last destinations of our Sicilian road trip, and had an ungrateful position of coming after Marettimo. As Marettimo was the highlight of our trip which triggered instant crush, these two towns weren't expected to live up to three days we spent on the island. And they didn't, which doesn't mean that each of them isn't a beautiful town in its own right. 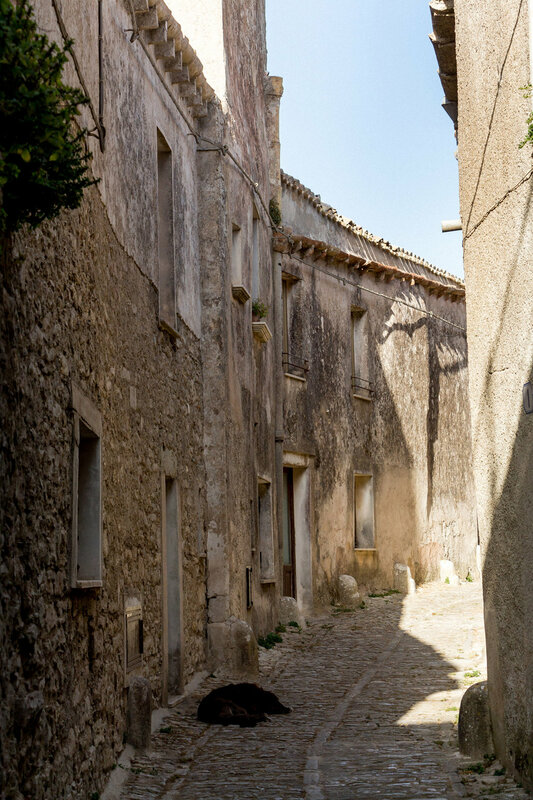 A friend of mine told me once that Erice is the most beautiful town she has ever been to. To me, it was only beautiful (if there is such thing as 'only beautiful'), but I enjoyed its cobbled streets and stone houses, the amazing views of San Vito lo Capo on one side, and Trapani with Egadi islands on the other side (Marettimo again, I know), but especially, the scent of baked sweets coming from Pasticceria Maria Grammatico. 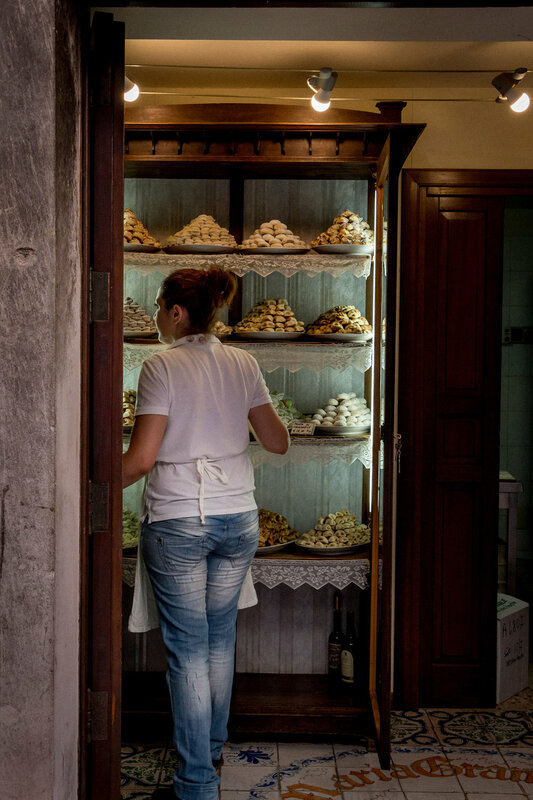 Sicily is already very well known for its delicious sweets that include the cannoli, genovesi, gelato and granitas, chocolate, cassatas, brioches, cornetos etc., but at this pastry shop you can find the frutta martorana, that is, unbeliavably realistic marzipan fruits, typical of this region. We took home (as presents for our parents) boxes filled with figs, cherries, tomatoes, pears, peaches and lemons, all of them beautiful like sculptures, almost too beautiful too eat. Almost, as those marzipan treats are a treat even for marzipan sceptics (such as my husband Luka). 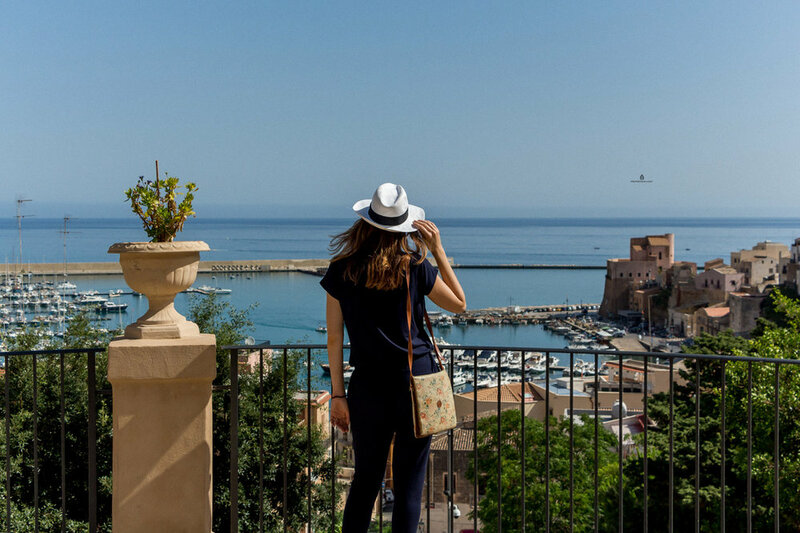 Sightseeing around noon in the height of Sicilian summer is never a good idea, but a traveler's got to do what a traveler's got to do. We had to see Erice, but we also had to spend a good amount of time in the fig shade on the back terrace of Maria Grammatico. Luka with a freshly filled cannolo (crunchy pastry roll with ricotta cheese), me with a genovese (pastry filled with delicious cream). To each his own. Here is a good little insight into the background of this world famous bakery should you be interested. Both Erice and Castellammare are quite touristy destinations, which was definitely an antidot to quiet and secluded Marettimo. Where there were three restaurants and about two souvenir shops on Marettimo, there was a ceramic shop on every other corner of Erice, and unfortunately those touristy bags and hats selling shops as well. Restaurants lined one next to another at the boardwalk of Castellammare. Buzzing on the streets, a mix of locals, mostly Italian and some foreign tourists, kids running in front of gelaterias, trendy music coming from hipster bars serving both affettati (Italian cold cuts) and burgers. We wandered around, soaking in the atmosphere (feeling a bit out of place and without a need to join the party), and just enjoying one of those typical Sicilian, hot summer evenings. 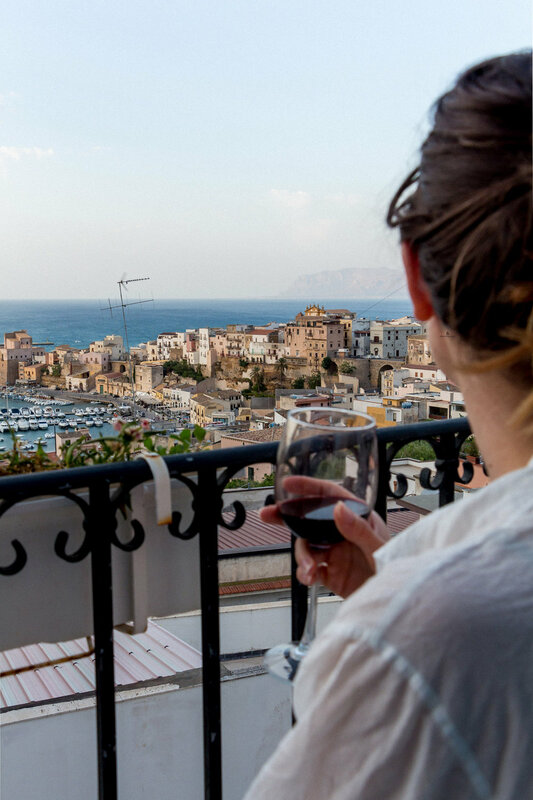 We had a room with a beautiful view of Castellammare for the next two days, and thankfully we still had a bottle of oh so good wine from Marsala and cantuccini cookies to dip in. So the sunsets were for sipping a glass of wine on a tiny balcony that overlooked the town. Luka even woke up early one morning and took a few beautiful photos of a golden dawn over Castellammare. If we put the heat aside, the town was actually quite a beautiful place. Surrounded by the sea, with tall city walls, houses pressed together as in some kind of fantasy town. With a lovely public garden overlooking the sea. So Sicilian. We drove to the Riserva Naturale dello Zingaro only to find out that it was closed for visitors because of extremely high temperatures and strong southern wind (in other words, fire hazard). And we truly respected Sicilians for closing it down. Taking care of their beautiful nature. Instead, we went to La Tonnara beach (which we did have to pay) and took a much needed swim on a sizzling summer day. When Luka said to the ticket seller: "Fa molto caldo oggi" ("It is very hot today. "), she answered: "Da morire." (So hot I could die.) That was about it. As we are always on a hunt for good food, and we weren't impressed with what Castellammare had to offer, on our second night we drove about half an hour into the countryside to a restaurant called Il Frutto della Passione that had amazing reviews. The night already fell as we were driving the empty roads, the empty little villages that looked almost abandoned, thinking "This place better be good." And it was. In the middle of nowhere, in a dark little village, there was a family run restaurant with a warm atmosphere and delicious, well thought of dishes. I had to have the gamberro rosso prawns for my last evening on the island, Luka had little zucchini tarts, an explosion of flavors. We fell for a chocolate dessert with passion fruit (grown by a local that loves to cultivate unusual fruit and vegetables-love this kind of stories), and decided to grow one in our garden (that still has to be done). On our flight back home the next day, we were already writing down all the delicious dishes we tried in Sicily. We already visited Sicily once before, for our honeymoon three years ago. When we came back this year, we felt like we were coming back, if not home, then to a dear and familiar place. My excitement rose as soon as we landed to Sicily's Falcone-Borsellino airport, then we were greeted by friendly Sicilian faces (you could immediately feel the change in attitude from Northern Italy where we left from); the heat wave that splashed us as soon as we left the airport building brought instant memories from our last visit to Sicily, and then as we started driving through its bare, majestic landscape I really felt that we were coming back. Sicily is our place, with its unbelievaby beautiful towns and unbelievably dirty roads, friendly, curious people and stray dogs, clear sea and soiled beaches, we are taking all of it. And I am confident that we will be back.